Ellen Schlechter designed a calving app when she was in high school to help her family's springtime work on the farm go more smoothly. 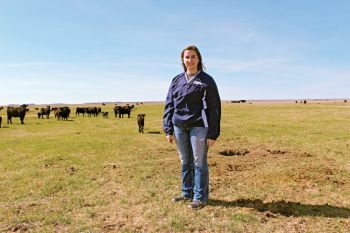 Keeping track of cattle is now as easy as a few taps on a smartphone screen, thanks to the dogged determination of a Faulkton High School senior. Ellen Schlechter lives on a farm between Miller and Faulkton. She says her family had been searching for a phone app because between two pastures and several people handling the herd, their traditional calving book was always missing. They thought they found a winner, but discovered the app was unable to track many of the things they wanted and could not cross platforms between iPhones and Androids. “So my family literally told me to make it happen,” she says. She experimented with writing code, but had little time to learn it after farm and schoolwork. Then she found a program that simply allowed her to enter the features she wanted, and soon The Calving Book was created. Farmers can track calving, breeding, pregnancy and weaning on the app. Since its release in October 2014, over 6,200 accounts have been created. Schlechter continues to tweak the app based on feedback from users. The Calving Book is available for iPhone in the App Store and for Android in the Google Play Store. Editor’s Note: This story is revised from the September/October 2016 issue of South Dakota Magazine. To order a copy or to subscribe, call (800) 456-5117. Smart Gal! Good work! I would like to know the program Ellen used to create her App. I can't handle the coding thing either!